Despite the revival of blue-chip stocks, the Vietnam’s benchmark, VN-Index, dropped below 500 on July 26 as investors lost patience. The measure of 249 companies and four mutual funds listed on the Ho Chi Minh Stock Exchange declined 0.44 percent, or 2.21 points, to open the week at 498.1. Trading volume rose slightly over the previous trading session as 42.46 million shares were traded at VND1.23 trillion. On the index, 56 stocks advanced or treaded water, while 141 fell. Binh Chanh Construction Investment Shareholding Company (BCI) tumbled 18.23 percent to VND46,200. The company will issue 18,067,000 shares to sell to its current shareholders at a ratio of 3:1 and a price of VND20,000 per share. This is a part of the plan to issue more than 21 million shares, increasing its chartered capital to VND752.6 billion from VND542 billion. Godaco Seafood Joint Stock Company (AGD) and Nari Hamico Minerals Joint Stock Company (KSS) both sank 4.86 percent to VND35,200 and VND37,200 respectively. Chuong Duong Beverages Joint Stock Company (SCD) closed down 4.85 percent to VND29,400. Saigon Thuong Tin Commercial Bank or Sacombank (STB), the sole gainer in banking stocks, topped the list of most active shares by volume with 2.11 million changing hands. Ocean Group Joint Stock Company (OGC) was behind with 2.05 million shares, followed by Refrigeration Electrical Engineering Corporation (REE) with 1.97 million shares traded. Baominh Insurance Corporation (BMI) gained 4.86 percent to VND19,400. According to the company’s preliminary business report for first half of this year, its pre-tax profit have climbed to VND103 billion, up 6 percent year-on-year, to reach 54.2 percent of this their goals for the year. 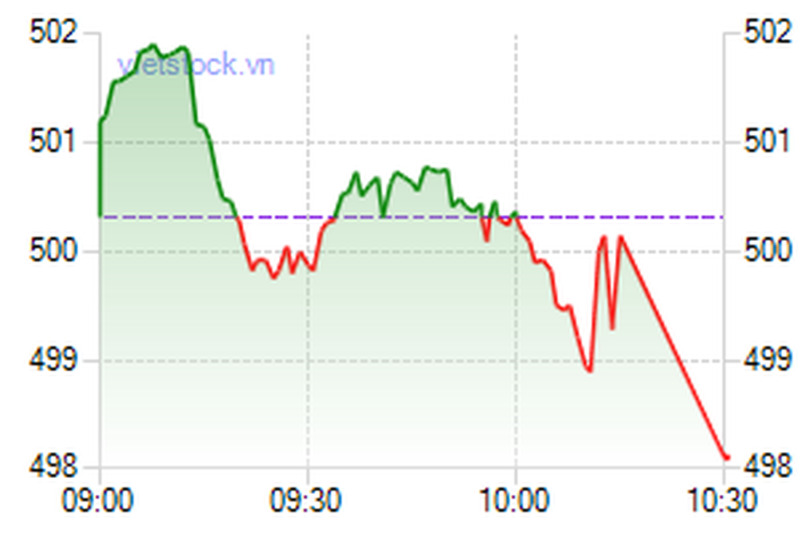 Hoa Binh Construction & Real Estate Corporation (HBC) advanced for the second day, adding 4.84 percent to VND43,300. The smaller bourse in the north also slumped as Hanoi’s HNX-Index lost 2.29 points, or 1.45 percent, to 155.7 points. Trading volume fell to one-month low as nearly 30 million shares, worth VND873 billion, changed hands. The UPCoM-Index dipped 0.52 points, to 54.27. A total of 343,800 shares were traded at a value of VND6.05 billion as of 11 am local time.